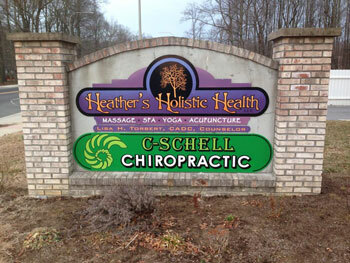 Many services under one roof – welcome to C-Schell Chiropractic! Since 2006, Dr. Chris Schellinger has delivered natural, safe and conservative chiropractic care to patients of all ages. C-Schell Chiropractic opened in 2007 as a modern health care facility providing pain relief and wellness for a variety of conditions and concerns. We’re located in the same building as Heather’s Holistic Health, owned by Dr. Chris’ mother, where you’ll find massage, yoga and acupuncture. Under one roof, you can benefit from a range of complementary health care services to restore your well-being. In addition to chiropractic care, we offer adjunctive services such as intersegmental traction, electric muscle stimulation and therapeutic laser to aid in the healing process. Every man, woman and child can see numerous benefits from chiropractic care. Often, people seek Dr. Chris’ help because they’re experiencing pain. Discomfort in the neck and back, headaches, sciatica and disc problems are common issues we see at our chiropractic office. Chiropractic care can also be used to help you maintain your wellness after you’ve resolved a health crisis. Many of our patients choose to have periodic visits that assist in maintaining their health. Dr. Chris also provides safe, gentle and effective care for babies and children. Kids with ear infections, asthma and other childhood issues can see a great benefit from our care. Pregnant moms are also welcome, and Dr. Chris often treats car accident victims and work-related injuries. Get started today!